Reading and share top 25 famous quotes and sayings about Career And Love by famous authors and people. Browse top 25 famous quotes and sayings about Career And Love by most favorite authors. 1. "Blythe Danner is somebody whose career I admire. She's a great actress and does good work, but also has a life of her own. I love my job but, at the end of the day, I want to come home and watch a movie and drink a bottle of wine with my husband." 2. "Career is too pompous a word. It was a job, and I have always felt privileged to be paid for what I love doing." 3. "When I say ‘I love you' I don't mean that I love what being with you does for my career, or I love how often you're willing to shag. I mean I love you. I love making you laugh, and seeing how you react to things, and getting to know the little things about you. I love who I am with you, and I'm trusting you not to hurt me." 4. "I was aware of doing only a so-so job on the grown-up career front, but I didn't really care, because there were two big exam questions I wanted to be sure I answered fully: the question of art, and the question of love." 5. 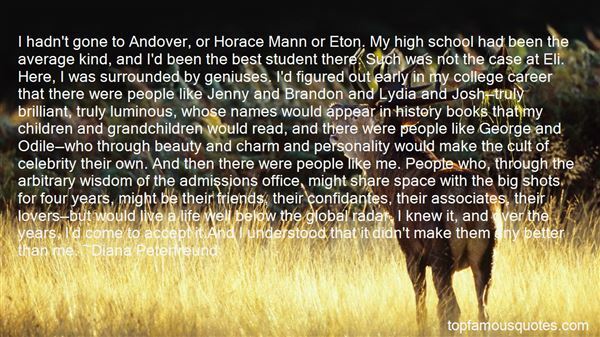 "I hadn't gone to Andover, or Horace Mann or Eton. My high school had been the average kind, and I'd been the best student there. Such was not the case at Eli. Here, I was surrounded by geniuses. I'd figured out early in my college career that there were people like Jenny and Brandon and Lydia and Josh—truly brilliant, truly luminous, whose names would appear in history books that my children and grandchildren would read, and there were people like George and Odile—who through beauty and charm and personality would make the cult of celebrity their own. And then there were people like me. People who, through the arbitrary wisdom of the admissions office, might share space with the big shots for four years, might be their friends, their confidantes, their associates, their lovers—but would live a life well below the global radar. I knew it, and over the years, I'd come to accept it.And I understood that it didn't make them any better than me." 6. "I was chomping at the bit to get my career started - so after I took all the theater courses at Brooklyn College I enrolled in a two year program at AMDA in the city (The American Musical Dramatic Academy) I was there for 6 months and loved it." 7. "You do NOT fear your OWN ability to COMMIT. Just think about your unwavering dedication to your career, your notion of sisterhood and friendship. You are tireless. That is why we all lean on you. Because you are totally committed to the lot of us. You do not have a "fear of commitment" that's just an easy way out of all of this. What you have dearest one, is a deep seated and totally understandable fear of OTHER people's commitment to YOU. I totally wholeheartedly agree, you've never been in love. Until Zac, you've chosen chaps whom you've simply liked but who have loved you. so when it's over, it hasn't hurt you. Why have you done this, over all these years? I'll tell you why, because what YOU actually fear is being left by someone YOU love. Your fear of COMMITMENT centres solely on another's commitment to YOU'It makes"
8. "My dream career would be to be in things that have real heart and are telling real stories but while doing that, you're getting really big laughs. I don't necessarily love the straight crazy comedies. 'Caddyshack' is amazing, but there's not a lot of new 'Caddyshack's." 9. "Romeo and JulietRomeo and Juliet is a tragic play written early in the career of William Shakespeare about two teenage "star-cross'd lovers" whose untimely deaths ultimately unite their feuding households. It was among Shakespeare's most popular plays during his lifetime and, along with Hamlet, is one of his most frequently performed plays. Today, the title characters are regarded as archetypal "young lovers". (From Wikipedia)"
10. "Balance is key: I need to be successful in my career to feel fulfilled, be surrounded by people I care about to share it with, and have my health to be able to do the things I love to do!" 11. "I've made a career writing about fictitious anti-heroes. To create these worlds, I've spent a lot of time with active members on both sides of the law. 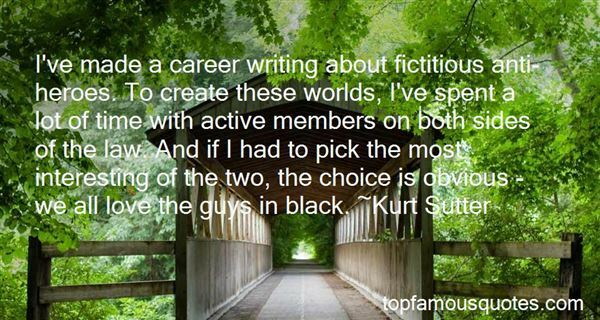 And if I had to pick the most interesting of the two, the choice is obvious - we all love the guys in black." 12. "Some women choose to follow men, and some women choose to follow their dreams. If you're wondering which way to go, remember that your career will never wake up and tell you that it doesn't love you anymore." 13. "I make my share of mistakes, but one I never make is to underestimate the power of things. People imbued from childhood with the myth of the primacy of feeling seldom like to admit they really want things as much as they might want love, but my career has convinced me that plenty of them do. And some want things a lot worse than they want love." 14. "All women on earth-- and men, too for that matter-- hope for the kind of love that transforms us, raises us up out of the everyday, & gives us the courage to survive our little deaths: the heartache of unfulfilled dreams, of career and personal disappointments, of broken love affairs." 15. "It's only when you grow up, and step back from him, or leave him for your own career and your own home - it's only then that you can measure his greatness and fully appreciate it. Pride reinforces love." 16. "Our career is a dream. I mean, we get to act, travel around the world, and meet cool people. What's not to love!" 17. "I have to know you'll be happy; have what you want,what you can live with. I want forever from you. ""All right." 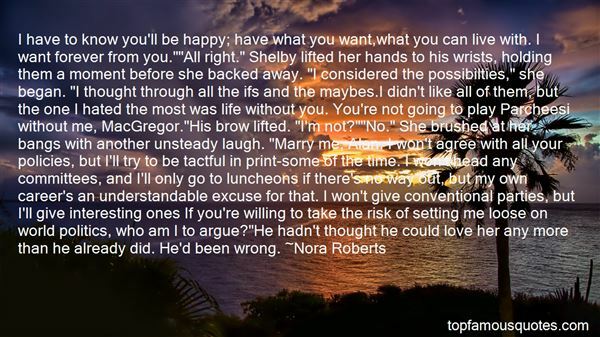 Shelby lifted her hands to his wrists, holding them a moment before she backed away. "I considered the possibilties," she began. "I thought through all the ifs and the maybes.I didn't like all of them, but the one I hated the most was life without you. You're not going to play Parcheesi without me, MacGregor. "His brow lifted. "I'm not?""No." She brushed at her bangs with another unsteady laugh. "Marry me, Alan. I won't agree with all your policies, but I'll try to be tactful in print-some of the time. I won't head any committees, and I'll only go to luncheons if there's no way out, but my own career's an understandable excuse for that. I won't give conventional parties, but I'll give interesting ones If you're willing to take the risk of setting me loose on world politics, who am I to argue? "He hadn't thought he could love her any more than he already did. He'd been wrong." 18. "Long into my career I harbored a secret sense that thinking and reading and writing, as much as I loved them, did not qualify as "real work." 19. "I told my agent which women I aspire to have a career like: Frances McDormand, Kate Winslet, Laura Linney and Emma Thompson - character actresses who have something to say. I also said that I loved Madeline Kahn and Jessica Lange." 20. "A challenging career suddenly seemed more productive to me because I could measure the results of my work. These precious little ones had endless needs. They were busy little sinful creatures who demanded all of my body, time, life, emotions, and attention! As much as I loved my children, I often felt like a failure. Surely someone else could do a better job with these precious ones than I. And what exactly was I supposed to be accomplishing anyway? Was I wasting my time? What had this husband, who professed to love me, done to me?" 21. "Not many people understood the inherent pain of a career in heroics. Your body aches from the demands of day-to-day protection. Your mind whirs with the things you did wrong, the ways you could've done better, the scores of citizens you didn't save. And when you lose someone you love, when their blood forms a puddle beneath your cheek while you watch… Your name, Watcher, becomes the cruelest agony of all." 22. "Embracing an attitude of gratitude is nourishing to the soul. When we allow ourselves to be engulfed in gratitude, this abundant soul nourishment overflows to your relationships, careers, and day to day lives. Act in gratitude today… If you are grateful to those you love, show them. If you are grateful to those who have helped you, show them. If you are grateful to your creator, to your family, to your friends, and you want it to be known, let it be shown!" 23. "Both back when I was acting and now that I'm writing, I've always wanted the same thing out of my career: to be able to get up in the morning and do what I love doing." 24. "Well, I'm a writer by nature, and I got a little bit - a little taste of a daily fast-paced writing job, writing career, and I loved it." 25. "Theater in Chicago will always be my first love. It started careers for me and about 50 of my friends. We all love coming back. As soon as the TV show is over, I'll be back in Chicago, doing live theater." If you get condemnation out of the Gospel, you put the condemnation into it yourselves! It is not the Gospel, but your rejection of it that will condemn you. "–1893, Sermon 2300"